1996-03-04. New. Ships with Tracking Number! INTERNATIONAL WORLDWIDE Shipping available. Buy with confidence, excellent customer service! 1996-03-04. Good. Ships with Tracking Number! INTERNATIONAL WORLDWIDE Shipping available. May not contain Access Codes or Supplements. May be ex-library. Shipping & Handling by region. Buy with confidence, excellent customer service! Dover Publications. PAPERBACK. 0486292339 New Condition. . New. Lundberg Press, 2007-03-15. Paperback. Used:Good. Lundberg Press, 2007-03-15. Paperback. Good. Dover Publications, 1996-09-10. Dover ed. Paperback. Used:Good. Lundberg Press. PAPERBACK. 1406729841 Special order direct from the distributor . New. NY: William Morrow, 1947. Near fine in a very good dust jacket. The page edges of the book are a little darkened. The jacket has numerous closed edge tears, and two chips, one at the bottom of the front gutter and the other at the head of the spine. Most of the "s" in the first word of the title is missing because of the second chip. The jacket spine is also darkened. Includes illustrations and seven maps (with the map at the rear being a folding map), bibliography and an index; 498 pages. Laid in is an article about the making of a television special about Lewis & Clark's expedition, and a newspaper review of this book.. First Edition. Hard Cover. (LEWIS & CLARK). BAKELESS, John. Lewis & Clark, Partners in Discovery. N.Y., 1947. 1st ed. Illus. 498pp. Orig. cloth. Very good. Dover Publications. PAPERBACK. 0486292339 Like New Condition. . Fine. Wm. Morrow and Co. Used - Acceptable. Former Library book. Shows definite wear, and perhaps considerable marking on inside. U.S.A. & England: Morrow, 1948 498 pages. The cover has light wear, tanning and scuffing. The edges of the book have light tanning and spotting. Dustcover price-clipped.. Hardcover. Very Good/Very Good. Size E: 8"-9" Tall (203-228mm). NY: William Morrow & Company, 1948. Minor pencil marginalia, otherwise text block clean and tight in lightly edge-worn binding. Jacket moderately spine-faded, worn and edge-chipped. 498 pp. w/index. Second Printing. Cloth. Very Good/Good+ (in mylar). Illus. by B&W Illustrations. 8vo - over 7¾" - 9¾" tall. Hard Cover. New York, NY: William Morrow, 1947. Text/BRAND NEW. Laminated boards/NF w/light pushes to corner tips. DJ/None as Issued. Numerals to front cover verso. First published 1947; this is a reprint of 1968. 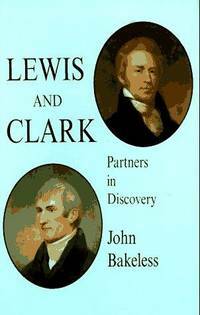 A dual-biography, by historian John Bakelss (1894 - 1978), of Meriwether Lewis (1774 - 1809) and William Clark (1770 - 1838). and the Lewis and Clark Expedition (1804 - 1806). Portrait of the two men, their exploration of the Northwest, and men they met along the weay.. 5th Printing of 1968. Hard Cover. Near Fine/None as Issued. Illus. by George A. Berk (Maps). New York: William Morrow, 1947. First. hardcover. good. Illus. 498pp. 8vo, gray cloth, front cover lightly soiled and lightly dampstained. New York: Morrow, 1947. Dover Publications. PAPERBACK. 0486292339 *LIKE NEW* Ships Same Day or Next! . Fine. Dover Publications. PAPERBACK. 0486292339 *BRAND NEW* Ships Same Day or Next! . New. Dover Pubns, 1996. clean, unmarked copy.. Trade Paperback. Fine. Dover Publications, 1996-09-10. Paperback. Like New. 1996 edition, book reflects age. Book has shelf wear from storage and use, there is slight creasing to the bottom front of the front cover; otherwise the book is in very good condition. Dover Publications, 1996-09-10. Paperback. Good. Mineola, New York, U.S.A.: Dover Pubns, 1996. NEW copies, No marks, Unabridged reprint; 528 pages, First authoritative biography of two great explorers. Based on original research and diaries of expedition members, book records day-by-day occurrences, dangers, hardships, Indian customs and lore, much more. Contains much material unknown before original publication. 29 illustrations, 7 maps. FREE TRACKING and DELIVERY CONFIRMATION. Soft Cover. New. 8vo. William Morrow & Company. Used - Good. Shows some signs of wear, and may have some markings on the inside. William Morrow. Bakeless, John. Lewis and Clark: Partners in Discovery. New York: William Morrow, 1968. 498pp. Indexed. 8vo. Paperback. Book condition: Very good with rubbed and bumped edges. . Very Good. 1968. William Morrow and Company, Inc. , 1947. Book. Good. Paperback. 8vo - over 7¾ - 9¾" tall. Apollo Editions A-40. Good condition soft cover book. No remainder marks or clippings. Covers are clean, show mild wear. No writing or tears inside book. Tight spine, clean pages. 498 pages. .
Dover Publications. Used - Very Good. Ships from the UK. Great condition for a used book! Minimal wear. 100% Money Back Guarantee. Your purchase also supports literacy charities. U.S.A.: Dover Publications, 1996. Book. Very Good. Soft cover. Signed by Author(s). Ex-Lib. .
William Morrow & Company, 1947-01-01. Paperback. Good. Dover Publications. PAPERBACK. 0486292339 Mild to moderate shelf/reading wear. Binding good. Orphans Treasure Box sells books to raise money for orphans and vulnerable kids. . Good. Dover Publications. Paperback. GOOD. Spine creases, wear to binding and pages from reading. May contain limited notes, underlining or highlighting that does affect the text. Possible ex library copy, thatâll have the markings and stickers associated from the library. Accessories such as CD, codes, toys, may not be included.